The D’Amore-McKim School of Business at Northeastern University offers two optional residency courses that provide an immersive learning experience. Domestic and international residency courses are available for students enrolled in the Online MBA program. Both residency courses offer students a platform where they can interact in a face-to-face group setting while learning key concepts from real-world applications. What is the international field study course? Designed to expose students to global business in action, the 8-day international field study course involves trips to select countries or regions outside of the U.S. Students meet on a monthly basis prior to departure and then attend classes and company visits during the trip. Visits to cultural sites and major landmarks further enhance these global academic experiences. Online MBA students are eligible to apply for an international field study residency course once they complete their first-year core courses in good academic standing. Most advisors and previous program participants suggest selecting a destination that students may not otherwise prioritize for a personal trip. Added to that, concepts covered and trip dates can help students select the one best aligned with their interests and time commitments. One of the key academic benefits of this study abroad program includes earning three elective credits toward Northeastern’s Online MBA degree through an invaluable international experience. Students generally return from these trips with a deeper understanding of global nuances of international business, along with refined critical skills and new perspectives on business and cultural practices of a particular region. Northeastern Online MBA graduate Kara Thayer shared her thoughts on the immeasurable value of the international field study program, explaining that the opportunity to study abroad was one of the reasons she chose to attend Northeastern over other online MBA programs. “I went to Turkey and Greece and I had access to companies like I have never experienced with other companies than my own,” Thayer said. The international field study residency course especially benefits students looking to pursue a career in global business. With company visits and presentations from senior-level executives, these programs offer students invaluable international exposure and networking opportunities. In a webinar presentation , Matt Foster, Director of Online MBA Programs at the D’Amore-McKim School of Business, spoke about the reality of these networking opportunities. One student introduced himself to the CFO for IBM in the Middle East after a presentation and the conversation led to that executive asking the student to share his resume. This kind of networking is advantageous for students with the geographic flexibility to pursue positions beyond the U.S.
International field study participants also have an opportunity to network with other Northeastern University students, many of whom they continue connecting with after the trip. While the focus is on learning and professional networking, the cultural takeaway from traveling abroad for such an immersive international experience leaves students with a new understanding of a different way of living—both from a business perspective and a personal one. What is the on-campus residency course? This intensive one-week program gives Northeastern University’s Online MBA students the option to study at one of the university’s campuses. It’s a unique opportunity to meet and interact with other online students as well as faculty in an on-ground classroom setting. This residency course option is available for Online MBA students who have already completed at least three courses. Campus-based residency programs may take place at Northeastern University’s main campus in Boston, Massachusetts, or at other campus locations including Charlotte, North Carolina, and Seattle, Washington. Northeastern University’s professors also design these courses specifically for the one-week intensive format, which means the courses are unique to the residency program and are not otherwise available for students to take in the regular online curriculum. The nature of the courses is also slightly different from online classes, with features such as additional classroom deliverables, group exercises, and presentations. The most significant professional benefit of the domestic residency course is the opportunity to network with other Online MBA students and professors in person. Many of these fellow business professionals can become valuable connections now and well into future careers. Students also expand on their knowledge by taking part in company visits during the one-week course and having the opportunity to network further with the connections they make during these visits. For many students, the on-campus residency course fulfills the desire for some face-to-face learning without the time or distance constraints. 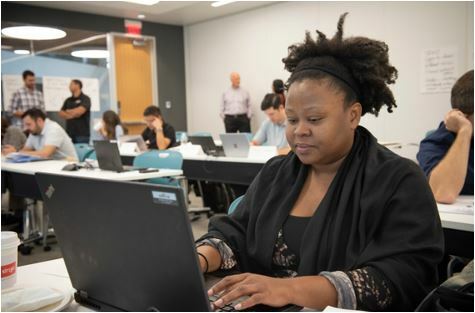 By having the chance to complete a three-credit course within a week’s time, students are able to fast track a course, compared to the five weeks that are required to complete each online course for the Online MBA program. When students choose the international field study residency course, they can gain fresh perspectives on the cultural and economic influences that affect global business. On the other hand, on-campus residency courses immerse students in campus culture and student life. Personal career and educational needs are often the most important elements when choosing between the residency options. Whether students decide to pursue one over the other or choose to do both, they will be able to expand their knowledge, network with peers and faculty in person, and complete a three-credit course in a short period of time. Online MBA programs with hybrid learning options afford students the flexibility of distance learning while still offering an opportunity for face-to-face learning and interaction. Connect with an advisor to learn more about the optional domestic and international residency courses available through the Online MBA program at the D’Amore-McKim School of Business.